2. In a small bowl, whisk together vinaigrette ingredients and set aside. 3. Place pecans on a parchment-lined baking sheet and toast until fragrant and lightly browned. Remove from heat and set aside to cool. 4. Snap off ends of asparagus. Stem asparagus until they turn bright green, about 5-6 min. 5. Remove from heat and place of a serving dish. 6. 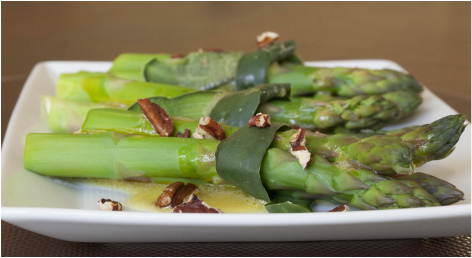 Drizzle vinaigrette over asparagus and top with toasted pecans. 1. Heat 1/8 cup olive oil in a large saute pan. Saute leeks and fennel for 6-8 min. until soft. 2. Stir in thyme and spinach and cook covered for 2-3 min. until spinach has wilted. 3. Stir coconut milk into mixture. 4. Transfer mixture into a heavy duty blender (like a Vitamix). Puree on highest speed until very smooth. 5. Blend in lemon juice, salt and olive oil. 6. Set aside until salmon is cooked. 3. Rinse salmon and pat dry. 4. Place 1/2 of thyme sprigs on parchment paper so that salmon will lay on it. 5. Rub olive oil and salt over fish and lay on thyme. 6. Place remaining sprigs of thyme over top of salmon. 7. Turn off oven temperature and cook in over for 10-12 or until salmon is pink on the inside. 8. Drizzle verde sauce over salmon and serve. 1. In a small pot, bring apple juice to a boil over medium-high heat. Once boiling, remove from heat and cool slightly. 2. Place cashews and syrup in a food processor and pulse for 10-15 seconds. With processor running, slowly add juice a little at a time until you reach the desired texture (you may not need all the juice). 2. 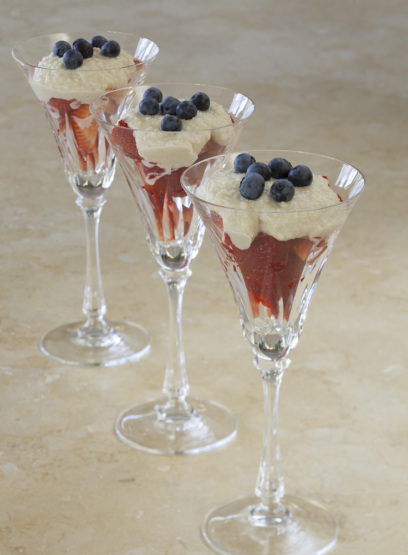 Fill berries 3/4 of the way in parfait glasses, reserving a few blueberries for garnish). 3. Layer the cashew cream over top of berries. 4. Garnish with fresh blueberries over the top. 5. Refrigerate and once cool, serve. Asparagus is a great way to greet springtime with these green spears. This simple side dish is easy to prepare and delicious. It has no cholesterol and little sodium. The fats come from healthy olive oil and nuts. It rich in vitamin K, folate and manganese and a good source of vitamin A and thiamin. It is low on the glycemic index and is moderately anti-inflammatory. 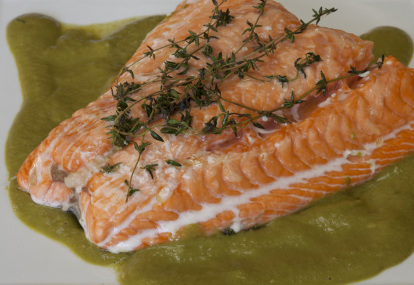 This salmon dish is high in omega 3 fatty acids known for being highly anti-inflammatory. This dish is low in sodium and even though the fat content is high, it is with heart-healthy fats. It is a good source of vitamin A and C, niacin and selenium. It is also rich in vitamin K and B12. There may be extra verde sauce (which will reduce the nutritional values below. Use the extra sauce to add flavor to other dishes. This dessert is a great way to have a treat at the end of the meal. Feel free to adjust the fruit to your particular preferences. To reduce calories, you can add less of the cashew cream. The parfait is low in cholesterol and sodium. It is a very good source of vitamin C and manganese. It also contains good amounts of magnesium and copper. It has a low glycemic index.